Marinate the meat a day in advance. Place all the ingredients for the marinade in a bowl and pour in the wine. Stir (make sure that the meat is well covered with the wine), cover with cling film and leave in the fridge. Take it out from the fridge a couple of hours before cooking to bring the meat and the wine up to the room temperature. Strain the meat well reserving the wine (it will be used for the sauce base), discard the chopped vegetables and herbs. Pat dry the meat cubes with a kitchen towel. Heat a couple of table spoons of olive oil in a large heavy based pan (big enough to contain the meat and the sauce) and start frying the pancetta or bacon until crispy and golden. Add the whole shallots and carry on frying stirring occasionally. Once the shallots become golden in colour and start to caramelise add the chopped onion. Fry all together until the chopped onion gains some colour and stir in the garlic cloves. Fry everything together for an additional 5 minutes. Now stir in the tomato puree and after 2 minutes add the flour to the pan. Stir it well and make sure the ingredients are well coated. We are creating here the base for the sauce called “roux”. After 2-3 minutes gradually start incorporating the wine stirring all the time. Don’t add it all at once but instead start with with one ladle and then add another one. That way you will avoid any lumps. Carry on the process until you’ve used all the reserved wine (if there is any wine left in the bottle you may want to add it to the sauce or have a glass of it while cooking instead) and pour in the beef stock (at room temperature) at the end. In the meantime in a separate pan heat up a couple of table spoons of olive oil and in batches brown and seal the beef cubes. Once you have browned all the meat add it to the pan containing the red wine sauce along with the juices released by the meat. Next place two bouquet garni in the sauce, season with salt and pepper, put the lid on and place the pan in the preheated oven to 160 C.
One hour (more or less) before you know that the meat is tender, take the dish out from the oven, add the chopped carrots and put back in the oven for another hour. Wash and slice the mushrooms (not too thinly). Take the dish out of the oven and put it on a low heat. Add the sliced mushrooms and cook for another 20 minutes. If you would like your sauce to be thicker, cook the dish on a low heat without the lid on stirring occasionally. Adjust the seasoning if needed. Discard the bouquet garni and garnish with the freshly chopped parsley. 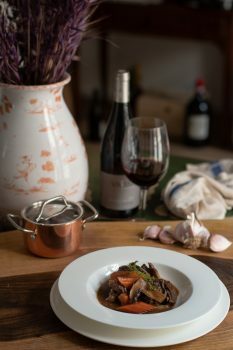 I really like to serve beef bourguignon with potato puree and ratatouille.